The summit will prepare both sides for a possible third Trump-Kim summit. 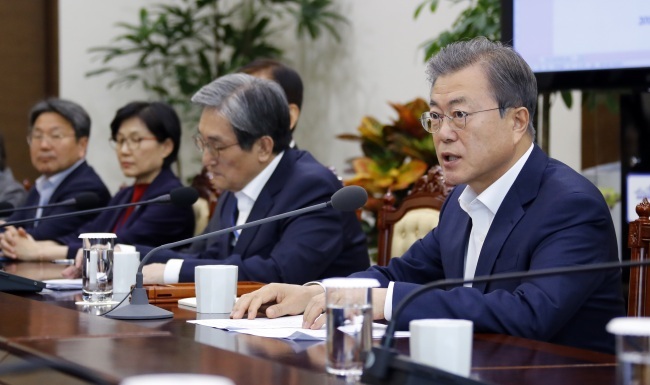 President Moon Jae-in on Monday called for another inter-Korean summit, saying that Pyongyang and Washington have expressed willingness to continue dialogue and that Seoul needs to lay the foundation for bigger results. “The Korean Peninsula peace process has entered the phase of building on the North-US Hanoi summit to prepare for practical results for the next stage,” Moon said at a weekly meeting with senior aides. “Now is the time to prepare and push for an inter-Korean summit,” Moon said, adding that North Korean leader Kim Jong-un has shown his “will to continue dialogue,” referring to Kim’s policy speech Friday. Seoul’s presidential office revealed plans to arrange a fourth inter-Korean summit after Moon’s meeting with US President Donald Trump in Washington on Thursday. Moon and North Korean leader Kim met on three occasions — twice at the border village of Panmunjom and once in Pyongyang — last year. Moon said his meeting with Trump served to reaffirm cooperation between the allies and to discuss strategies for carrying out the Korean Peninsula peace process. He added that he had met with top US officials and was able to reaffirm that the allies share the goal of achieving denuclearization and establishing peace on the peninsula through diplomatic means. During the trip, Moon met with US Secretary of State Mike Pompeo, national security adviser John Bolton and Vice President Mike Pence. “As soon as the North is ready, (I) hope that the South and the North can sit together to hold practical and detailed talks on ways to obtain results that go beyond the two North Korea-US summits,” Moon said. As for the North Korean leader, Kim said he is open to meeting Trump for the third time during his policy speech Friday. Kim, however, warned that the matter would become harder to resolve if the US does not take a different approach. “On condition that the US takes the right position, and seeks a method that can be shared with us and offers a third summit, (I) am open to try one more time,” Kim said. He added that if conditions acceptable to both sides are suggested, he would sign the agreement without hesitation.